These high quality products provide a maintenance free superb operation until the next planned major overhaul of the bogies. After this time, and depending on the configuration, the product can be replaced by a new damper, or be overhauled in a specialized workshop. The production line for these dampers makes use of the latest production technologies, which results in a high level of automation and the elimination of unnecessary handling. Due to the smart damper design and the efficient manufacturing process, we are able to offer these dampers at very attractive price levels. 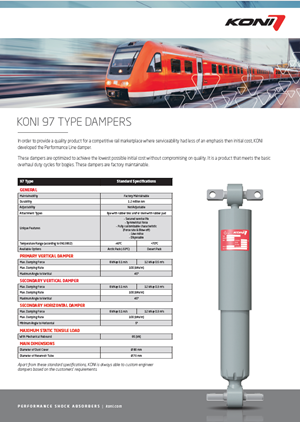 These dampers are optimized to achieve the lowest possible initial purchase price without compromising the quality of the product. Our Performance Line dampers operate according to a two-directional oil flow through the piston. The construction of the damper is such that the damping forces during the extension and compression stroke are symmetrical. the piston, while during the compression stroke the valve stack on top of the piston creates the desired damping forces.